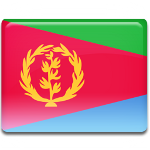 People of State of Eritrea annually celebrate Revolution Day on September 1. This public holiday commemorates the day, when the Eritrean Liberation Front led the revolution, that marked the beginning of the Eritrean War of Independence. The territory of Eritrea was colonized by Italy in 1890. In 1936 Italians invaded Ethiopia and also declared it a part of their empire, calling it Italian East Africa. During World War II, when Italy was conquered by the Allies, Italian East Africa was divided and Eritrea became a British protectorate till 1951. There were many disputes about Eritrea and its future after the British would leave. The UN proposed to federate Eritrea to Ethiopia. Nine years later, Ethiopian Empire Haile Selassie annexed Eritrea. The Eritrean Liberation Front organized a revolution on September 1 1961, that officially started the war. The Eritrean independence leader Hamid Idris Awate and his companions fired the first shots against the occupying Ethiopian Army and police. The Eritrean War of Independence ended on May 29, 1991. The state gained full independence from Ethiopia.